Last Friday was National Tequila Day, and I couldn’t have asked for a better group to celebrate with than my friends Amy, Lena and Delia. For the occasion we headed to Malo Restaurant, a familiar name to enthusiasts for its excellent tequila cocktails and tasting events. Although Malo had some cocktail specials for the night, I stuck with the traditional by starting with the 100% Organic Margarita, made with 4 Copas Blanco, 4 Copas agave nectar, and organic lime juice. The margarita was perfectly made and tasted particularly refreshing on a balmy Friday night. It was also exactly what I needed to temper the scorchingly hot salsa that accompanied the chips. For my next drink I went with The Spicy Cucumber, a tasty creation made with Casa Noble Crystal (Blanco), cucumber, agave nectar, fresh lime and chile. The smooth, peppery Casa Noble was enhanced by the cool taste of cucumber and nicely balanced by just the right amount of kick from the chile. By this time my ceviche soft tacos had arrived, which made for a wonderful food/cocktail pairing. I closed out with an Anejo Old Fashioned, a nice twist to a classic that featured Gran Centenario Anejo, agave nectar, and bitters. The cocktail’s smoky, oak flavors held their own after plenty of food and previous drinks; a great way to finish up an enjoyable meal. But it wasn’t the end of the night. 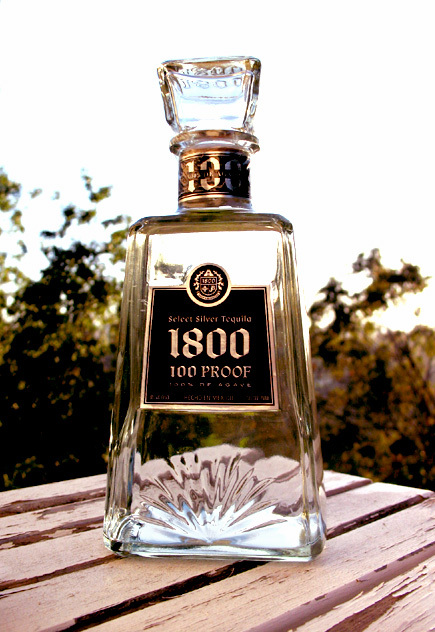 Mayahuel had smiled on me the day before, when I had received a sample bottle of 1800 Select Silver Tequila to review. Knowing my friends would be happy to help me with this task I brought the bottle with me, and after Malo we went back to Amy and Lena’s place to break out the barware. After admiring the elegantly designed bottle, your eyes will no doubt zero in on the words “100 proof.” According to the press materials the 1800 is targeted to the youth market, which would explain the extra kick. After opening the bottle, the extra 20 proof asserts itself with a strong initial aroma. Interestingly, the bottle stopper doubles as a shot glass. It’s a clever design element, though none of us had any desire to put it to use. This isn’t a tequila to be trifled with, so we limited ourselves to a single cocktail each. According to the company, the 1800 is twice distilled then blended with a bit of aged tequila, resulting in a blanco that’s smooth, crisp and strong. The 1800 made for quite tasty margaritas, and the extra punch was noticeable but not off-putting. Overall, the 1800 is a solid choice for mixing that, despite its intended audience, can still be appreciated by connoisseurs as well. From now until August 15th, 1800 Tequila is accepting entries for its “Win the Ultimate Man-Cave” sweepstakes at www.1800Tequila.com/mancave. The winner will receive $10,000 towards an ultimate “cave” featuring a new home entertainment system, game console, furniture, and (natch) a bar fully stocked with 1800 Select Silver. Faithful butler and Boy Wonder not included.